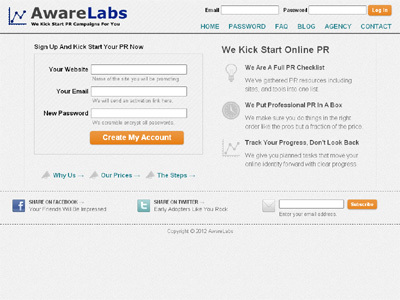 AwareLabs is a PR task list assembled to help guide startups through the initial phases of launching a campaign. While marketing my own startups I spent weeks researching PR, following successful entrepreneurs, and discussing strategy with PR professionals. Through the process I came to a conclusion. Most startups don’t know how to transition from development to PR and marketing effectively. PR Agencies are too expensive and most startup teams don’t have PR expertise. I built AwareLabs to provide a bridge for early startups. Gathering all I learned into a PR task list that every startup can complete, the same list professionals I spoke with use every day. The goal is to allow your startup to use funds more effectively once you do launch a PR campaign through a paid agency. Our task list is from the same checklist PR people use for you when you hire them. Complex processes can almost always be boiled down into timing and steps. Everything looks hard when you don’t know where to start. having a guide through the first few steps pays dividends down the road. By creating a check list of tasks, Awarelabs allows startups to spend time and energy more efficiently. Going through the PR task will position your startup for PR opportunities down the road. PR is a process of building reputation on prior success, the AwareLabs checklist ensures that. When you’re ready hire a PR agency. You’ll spend less because your PR campaign will start where AwareLabs left off.